With a reputation as being one of the most beautiful and diverse tourist spots in Asia, Bali attracts almost one million visitors per year from around the world. Consistently rated as one of the worlds’s most highly acclaimed island destinations by both Condé Naste and Travel & Leisure magazines. Bali is a treasure trove of beauty, culture and shopping not to be missed! Geographically Bali lies between the island of Java and Lombok, and is one of more than 18,000 islands that make up the Indonesia archipelago. Bali is small, stretching approximately 140 km from east to west and 80 km from north to south. Slightly off center, and running east to west are s string of volcanic mountains. The tallest is Gunung Agung, which last erupted in 1963, and is 3,142 m at its highest point. Located just 8 degrees south of the equator, Bali boats a tropical climate with just two seasons (wet and dry) and an average annual temperature of around 28 degrees Celsius. The rich volcanic soil and healthy monsoon season make those islands extremely fertile and a range of crops are grown throughout the year. The wide and gently sloping southern regions play host to Bali’s famed rice terraces, among some of the most spectacular in the world. In the hilly, northern coastal regions, the main produce is coffee, copra, spices, vegetables, rice and cattle. The Balinese people have strong spiritual roots and despite the large influx of tourists over the years, their culture is still very much alive. The main religion is Agama Hindu Dharma, which arrived in Bali with the spread of Hinduism through Sumatra and Java during the 11th century. Although originally from India, the Balinese religion is a unique bled of Hindu, Buddhist, Javanese and ancient indigenous beliefs, with customs that are very different from the traditional form of Hinduism practiced in India today. With the arrival of Islam in neighboring Java during the 15th century, a large number of courtiers, artists, musicians and craftsmen fled to Bali, creating an artistic renaissance. Naturally creative, the Balinese have traditionally used their talents for religious purposes and most of the beautiful work to be seen here has been inspired by stories from the Ramayana and other Hindu epics. The incredibly colorful cremation pyres and the everyday offerings to the Gods, placed inside every home, shop and business are made with an eye for detail and beauty. The majority of Bali’s 3,000,000 people live, for the most part, in tight village communities with large extended families. The largest tows are the capital Denpasar, and Singaraja in the north. The main tourist area is Kuta, situated near the airport. This small sleepy village became a major attraction during the tourist boom of the 70’s, because of its famed white sandy beaches, the surf, and stunning sunsets. Today, Kuta is a major hustling and bustling resort town, with hundreds of hotels, bars, restaurants and shops. Those in search of a little peace and quite tend to head for the more tranquil resorts areas of Sanur and Candi Dasa, on the east coast, or Lovina in the north. Nusa Dua, another tourist enclave in the southern most peninsula of the island, caters to the more up market crowd and is home to many of the bigger 5 – stars hotels. Super-exclusive “ 6 – stars “ resorts such as the Four Seasons and Aman Resorts also the island from Jimbaran Beach to Ubud. Ubud, in the hilly region of Gianyar, has also blossomed as a tourist attraction and is now considered to be the artistic and cultural center of Bali. Although there are no artifacts or record dating back to the Stone Age, it is believed that the first settlers on Bali migrated from the China around 2500 B.C. by the bronze ere, around 300 B.C. an advanced culture developed in Bali. The complex system of irrigation and rice production, still in use today, was established around this time. History is vague for the first few centuries. A number of Hindu artifacts have been found dating back to the 1st century yet it appears that the main religion, around 500 A.D. was predominantly Buddhist in influence. A Chinese scholar, Yi- Tsing, in 670 A.D. reported, on a trip[ to India, that he had visited a Buddhist country called Bali. I wasn’t until the 11th century that Bali received the first strong influx of Hindu and Javanese cultures. With the death of his father around 1011 A.D. the Balinese Prince, Airlanggha, moved to East Java and set about uniting it under one principality. Having succeeded, he then appointed his brother, Anak Wungsu, as ruler of Bali. During the ensuing period there was a reciprocation of political and artistic ideas. The old Javanese traits and customs adopted by the island. With the dearth of Airlanggha, in the middle of the 11th century. Bali enjoyed a period of autonomy. However, this proved to short lived, as in 1284 the East Javanese King Kertanegara, conquered Bali and ruled over it from Java. In 1292, Kertanegara was murdered and Bali took the opportunity to liberate itself once again. However, in 1343, Bali was brought back under Javanese control by its defeat at hands of Gajah Mada, a General on the last of the great Hindu – Javanese empires, the Majapahit. With the spread of Islam throughout Sumatra and Java during the 16th century, the Majapahit Empire began to collapse and a large exodus of aristocracy, priests, artist and artisans to Bali ensued. 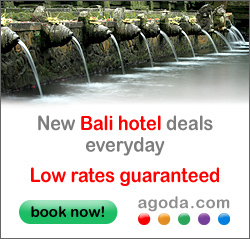 For a while Bali flourished and following centuries were considered the Golden Age of Bali’s cultural history. The principality of Gelgel, near Klungkung, became a major center for the Arts, and Bali became the major power of the region, taking control; of neighboring Lombok and parts of East Java. The first Dutch seamen set foot on Bali in 1597, yet it wasn’t until the 1800’s that the Dutch showed an interest in colonizing the island. In 1846, having had large areas of Indonesia under their control since the 1700’s, the Dutch government sent troops into northern Bali. In 1894, the Dutch forces sided with the Sasak people of Lombok to defeat their Balinese rulers. By 1911, all the Balinese principalities had either been defeated in battle, or had capitulated, leaving the whole island under Dutch control. After World War I, Indonesia Nationalist sentiment was rising and in 1928, Bahasa Indonesia was declared the official National Language. During World War II, the Dutch were expelled by the Japanese, who had occupied Indonesia from 1942 – 1945. After the Japanese defeat, the Dutch tried to regain control of their former colonies, but on August 17, 1945, Indonesia was declared independent by its first president, Sukarno. After four years of fighting and strong criticism from the international community, the Dutch Government finally ceded and, in 1949, Indonesia was recognized and an Independent country. Life in Bali is very communal with the organization of villages, farming and even the creative arts being decided by the community. The local government it responsible for school, clinics, hospital and roads, but all other aspects of life are placed in the hands of two traditional committees, whose roots in Balinese culture stretch back centuries. The first, Subak, concerns the production of rice and organizes the complex irrigation system. Everyone who owns a Sawah (or Padi field) must join their local Subak, which then ensure that every member gets his fair distribution of irrigation water. Traditionally, the head of Subak has his Sawah at he very bottom of the hill, so that the water has to pass through every other Sawah before reaching his own. The other community organization is the Banjar, which arranges all village festival, marriage ceremonies and cremation, as well as a form of community service known as Gotong Royong. Most villages have at least one Banjar and all males have joined one when they marry. Banjar, on average have a membership of between 50 up to 100 families and each Banjar has its own meeting hall called the Bale Banjar. As well as being used for regular meeting, the bale (pavilion) is where the local gamelan orchestras and drama groups practice. The Balinese are Hindu yes their religion is very different from that of the Indian variety. They do have a caste system, but there are no untouchables and occupations are not governed by caste. In fact, the only thing that reflects the caste system is the language which has three tiers; 95% of all the Balinese are Hindu Dharma, and speak low or everyday Balinese with each other, middle Balinese is used for talking to strangers, at formal occasions or to people of the higher Ksatriya caste, High Balinese is used when talking to the highest class, the Brahmana, or to a Pedanda (Hindu Priest). It may sound complicated, but most of the word at the low and medium levels are the same, whereas high Balinese is a mixture of Middle Balinese and Kawi, the ancient Javanese language. The Balinese worship the Hindu Trinity Brahma, Wisnu and Shiva, who are seen as manifestations of the Supreme God Sang Hyang Widhi, other Indian Gods like Ganesha (the elephant headed God) also often appear, but more commonly, one will see shrines to the many Gods and Spirits that are uniquely Balinese. Balinese believe strongly in magic and the power of spirits, and much of their religion is based upon this. They believe that good spirits dwell in the mountains and that the seas are home to demons and ogres. Most villages have at lest three main temples; The Pura Puseh or “Temple of Origin”, faces the mountains and is dedicated to the village founders; The Pura Desa or “Village Temple “, which is normally found in the centre and is dedicated to the welfare of the village; and The Pura Dalem, aligned with the sea and dedicated to the spirits of the dead. Aside from these “ Village Temples “, almost every house has its own shire and you can also find monuments dedicated to the spirits of agriculture, art and all other aspects of life, some temples, Pura Besakih for example, on the slopes of Mount Agung, are considered especially important and people from all over Bali travel to worship there. Offerings play a significant role in Balinese life as they appease the spirits and thus bring prosperity and good health to the family. Every day small offering trays (Canang Sari) containing symbolic food, flower, cigarettes and money, are places on shires, in temples outside houses and shops, and even at dangerous crossroads. Festivals are other great occasion for appeasing the Gods. The women bear huge, beautifully arranged, pyramids of food, fruit and flower on their head while the men might conduct a blood sacrifice through a cockfight. There are traditional dances and music, the Gods are invited to come down to join in the festivities. The festivals are usually very exciting occasions and well worth observing if you are in the areas. A crucial thing to remember, if you wish to join in celebrations or enter a temple, is there are a number of rules that have to be respected.